A fascinating item about the 400 Chinese bodies that were exhumed from graves around the South Island in 1901/2 so they could be taken back to China. Most of the Chinese families had saved lots of money to be able to do this and the Dunedin family the Sew Hoys were organising the return of the bodies and commissioned a ship, the SS Ventnor, to take bodies back to China. Can only imagine the organisation required to do that and know this was important to Chinese community. Unfortunately ship hit a reef off Taranaki and eventually sank off Hokianga. Maori from the area found bones and coffins and re-buried them in the urupa (cemeteries). This was not well publicised - between Chinese people not exactly being the citizens of high importance in 1902 and the Hokianga Maori being an isolated community there was no communication between the groups. It wasn't until the last few years that the story was revealed. 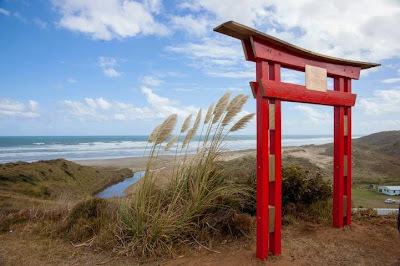 Last month there was a Ching Ming (feeding of the ghosts) organised and a bus load of Chinese families descended from those original Chinese settlers travelled to the Hokianga and in a ceremony to appease the ancestors.